“Automatic Data Processing, Inc (“ADP”)ADP is a high-quality, defensive business which is in the early stages of a long-term transformation that should drive significant value creation as it closes the performance gap and achieves its structural potential. 2018 was a critical year for ADP. In response to our 2017 proxy contest, ADP made broad commitments to shareholders to accelerate revenue growth, bolster its competitive position (specifically in the enterprise market) and improve operational efficiencies and margins. ADP began to execute upon these commitments in 2018 and introduced new medium-term (fiscal year 2021) targets at its June 2018 Analyst Day. At the Analyst Day, ADP provided a comprehensive update on the business trajectory and next-generation product portfolio. ADP committed to achieving accelerated revenue growth and operational efficiency improvements (targeting 23% to 25% adjusted EBIT margins) over the coming years. These projections represent substantial increases in management’s prior guidance. ADP’s new targets provide a credible plan for ADP to realize $7 of earnings per share by FY 2021 (vs. $4 at the time of our initial investment). We believe the targets still only capture a fraction of ADP’s structural potential, as we expect it will exceed its medium-term targets and make accelerated margin progress thereafter. In support of the operating targets communicated at the Analyst Day, ADP executed numerous transformation initiatives in 2018, including accelerating the company’s Service Alignment Initiative, executing an Early Retirement Program, moving up the roll-out of its next-generation product portfolio and strengthening the talent and performance culture at the company. In support of ADP’s transformation, the company promoted a current executive to Chief Transformation Officer and has further bolstered the management team with new external hires (including a new Chief Strategy Officer and Chief Financial Officer). 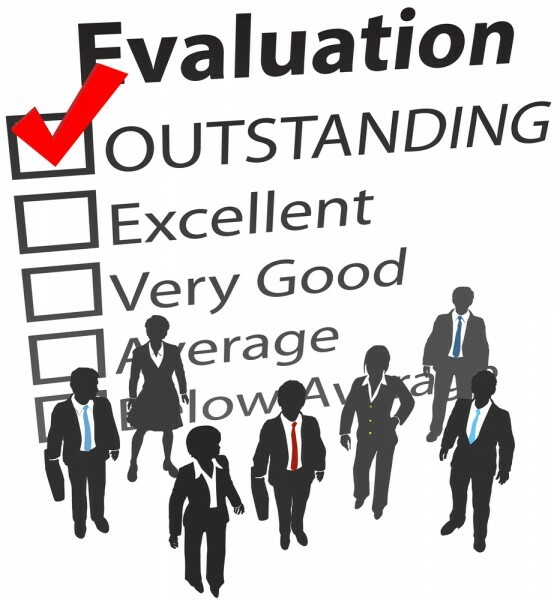 We view the hiring of external executives with relevant skills and fresh perspectives positively as it further assists ADP in executing on its transformation. Recent financial results have provided some early validation of the transformation underway at ADP as evidenced by accelerated organic growth, significant margin expansion and upward revisions in current fiscal year 2019 earnings-per-share guidance which now stands at $5.30 to $5.40 per share (an increase of 17% to 19% over the previous year). We believe ADP’s ongoing transformation will be further demonstrated over the coming quarters. Automatic Data Processing, Inc., (ADP) is a $68.30 billion market cap company that provides a variety of professional human resources-related services. It runs through two segments: The Employer Services and Professional Employer Organization. The company was founded back in 1949, and through 2014 it was one of the four American Companies among the S&P 500 to have a AAA credit rating from both Moody’s and Standard & Poor’s. Its headquarters is in Roseland, New Jersey. Year-to-date, the company’s stock is up by 20.24%, having a closing price of $156.79 on March 27th, while over the last 12 months, ADP’s share price gained 40.29%. ADP is trading at a price-to-earnings ratio of 38.05. Heading into the first quarter of 2019, a total of 42 of the hedge funds tracked by Insider Monkey were bullish on this stock, a change of 20% from the second quarter of 2018. 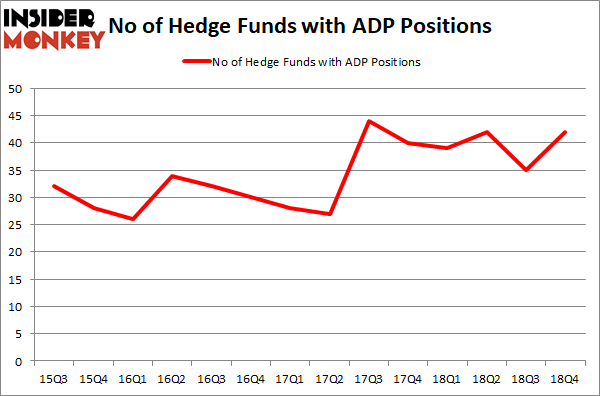 On the other hand, there were a total of 39 hedge funds with a bullish position in ADP a year ago. With hedge funds’ positions undergoing their usual ebb and flow, there exists an “upper tier” of noteworthy hedge fund managers who were upping their holdings considerably (or already accumulated large positions). Among these funds, Pershing Square actually held the most valuable stake in Automatic Data Processing (NASDAQ:ADP), which was worth $533.7 million at the end of the third quarter. On the second spot was Generation Investment Management which amassed $466.8 million worth of shares. Moreover, Cedar Rock Capital, Arrowstreet Capital, and D E Shaw were also bullish on Automatic Data Processing (NASDAQ:ADP), allocating a large percentage of their portfolios to this stock. In its last financial report for the second quarter of fiscal 2019, ADP reported revenues of $3.5 billion, up by 8% from the corresponding quarter of 2017 when the revenues were of $3.2 billion. The company also disclosed diluted earnings per share of $1.27 for the three months ended December 31st, 2018, which compares to diluted EPS of $1.51 for the three months ended December 31st,2017. ADP announced recently that it will report its third quarter of fiscal 2019 financial results on May 1st, 2019. Were Hedge Funds Right About Getting Into Bank of Montreal (BMO)? Were Hedge Funds Right About Dumping FedEx Corporation (FDX)? Were Hedge Funds Right About Ecolab Inc. (ECL)? Were Hedge Funds Right About Selling Northrop Grumman Corporation (NOC)? Is Illinois Tool Works Inc. (ITW) A Good Stock To Buy? Is Vertex Pharmaceuticals Incorporated (VRTX) A Good Stock To Buy?